(CNN) -- Go to Wikipedia at midnight, and you won't find any of the usual encyclopedia articles. Instead, you'll be greeted with a message about anti-piracy bills that are topics of heated debate in the U.S. Congress -- stirring opposition from tech companies in Silicon Valley and support from media companies in Hollywood. 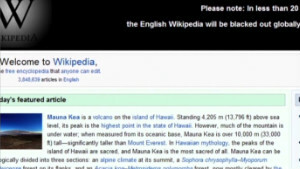 Wikipedia, one of the highest-traffic sites on the Internet, will shut down for 24 hours in protest of these laws, which the website says would make it very difficult -- maybe impossible -- for its nonprofit encyclopedia to continue to operate. The blackout starts at 12 a.m. ET on Wednesday. For more on the bills, see CNNMoney's story, "SOPA explained." Time Warner, the parent company of CNN, is among the industry supporters of the legislation. CNN: Tell me how you came to this decision to blackout the website for 24 hours? Wales: Back in early December we were starting to look at the pressure that was being put on for this to be rushed through very quickly and I opened up a discussion with the community as to whether we should perhaps protest -- following after the pattern of what we did in Italy after a bad law there. That discussion took some time to come to fruition because we're a very thoughtful and deliberative community. After a long process we held a vote which was overwhelmingly in favor of protesting this law. Free speech includes the right to not speak. Wales: The Wikipedia community. These are people who are editors of the website. CNN: Do you know how many people voted? Wales: We could get you the exact numbers. I'm not online at the moment. But it was hundreds of people who voted. The number of people participating in the discussion was 1,800. CNN: This is new, right, for Wikipedia to be taking a political action? Wales: It's quite new. The only thing that's similar to it is that the Italian Wikipedia did do something similar that was the inspiration a few months back, against a law that was proposed by the Berlusconi government. CNN: Tell me what people will find at your website after midnight. Wales: When they go there they'll find a notice explaining what's going on -- explaining our opposition to this and urging them to call their senator or representative. We're hoping to really drive a lot of noise in Washington so that people there will realize that just listening to Hollywood is not the best idea. CNN: I think a lot of people are still confused by the debate over these piracy laws. Can you explain your position in a clear, succinct way? Why are you so opposed to these (anti-piracy) laws that you would blackout your website? Wales: Within our community we're very strong defenders of copyright. We have very strict rules about obeying copyright and we don't link to materials that we know to be copyright infringement. That isn't really the issue. The other side will try to paint this as anybody who's opposed to this must be making money off of piracy or be in favor of piracy. That isn't true. The issue here is that this law is very badly written, very broadly overreaching and, in at least the Senate version, would include the creation of a DNS (domain name system) blocking regime that's technically identical to the one that's used by China. I don't think that's the right way the U.S. needs to go in taking a leadership role on the Internet. 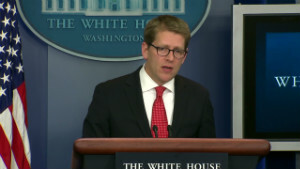 CNN: Do you think anything needs to be done to stop online piracy? Wales: Within the U.S. the Digital Millennium Copyright Act (PDF) notice-and-takedown provisions have worked very well. The question of whether foreign sites pose a legitimate problem is I think something that has not be sufficiently studied. It is a valid question. But when it comes to First Amendment concerns, censoring the Internet is never going to be the right answer. The right answer would be something like the alternative OPEN Act. I'm not necessarily supporting that one, but I'm saying, 'Gee, we need to take a look at other possibilities here.' We also need to take a look at whether this is the right thing to be worrying about in the first place. One of the things that we know is that spending on entertainment is actually up. So I view this as a bit of a power grab for Hollywood, crying wolf over something that's not as big of a problem as they make it out to be. CNN: There have been some really big statistics thrown around on the side of people who support these (anti-) piracy laws. Millions of jobs at stake. Billions of dollars in revenue loss for the U.S. economy. How do you respond to those figures? Wales: There was an academic study done by the London School of Economics that says the figures thrown around by Hollywood are wishful thinking. Wishful thinking meaning if you count every single download and pretend the person would have paid full retail for something instead of just not consuming it, then you get some pretty large numbers. But, from the point of view of an economist, that isn't necessarily the right way to measure. So I think those figures are radically overstated, particularly as we see that overall spending is up for entertainment. CNN: You mentioned earlier that these laws would 'censor' the Internet. How so exactly? Wales: One of the provisions in the Senate version, which is still out there, is that under certain circumstances Internet providers would be required to block access to sites, by removing them from the DNS entry list. So if you type in the domain of a site that's been accused of being devoted to infringement of copyright you wouldn't get an answer of whether that site exists. That's exactly what China does. They do blocking at the DNS level. CNN: Do you oppose that on a technical level or is it the philosophy behind it? Wales: It's a little bit of both. As we look at some of the interesting work that's going on technologically for DNS security, ways of validating that this is the correct website ... This is an actual critical problem that is being solved at a technical level. Except that DNS blocking would break the solutions that are already being implemented. The more philosophical point is (that) if you asked me where the Pirate Bay is located and I tell you the answer -- it's at this IP address -- that is speech. The Supreme Court has held that code is speech. And it doesn't matter that it's done on a computer or done face to face or done in a newspaper, reporting the facts of the world is protected speech. I don't believe the DNS blocking provisions will pass First Amendment muster, anyway, but it seems a shame to spend two years and a lot of court costs fighting something that's absurd on the face of it. CNN: I could see some people saying that's hypocritical, to shut down a site that's all about sharing and openness in the name of supporting an open and free Internet. Wales: Free speech includes the right to not speak. We are a community of volunteers. We have written this thing that we believe to be a gift to the world. We don't charge people for it. It's freely available to anybody who wants to (use it). We are a charity. And I think it's important for people to realize that the ability of our community to come together and give this kind of gift to the world depends on a certain legal infrastructure that makes it possible for people to share knowledge freely -- that the First Amendment is incredibly important in terms of the creation of this kind of thing. CNN: What's at stake for you in terms of lost donations or numbers of users? I'm sure you had to consider those things in making this determination. Wales: Actually we didn't consider those things very much at all. This is a principled stand. It comes from our community. We had this huge voting process. We just don't think in those kinds of terms. I believe our best long-term prospect for Wikipedia in terms of our survival ... depends on us being principled and making it known that, hey, Wikipedia is here to stand up for free and open Internet. I think that will drive donations in the long term. I think it will drive contributions. And, especially from what I've seen on Twitter, I think it will drive the passionate loyalty of our fans. People feel like if push comes to shove they can count on Wikipedia, and that really matters to people. 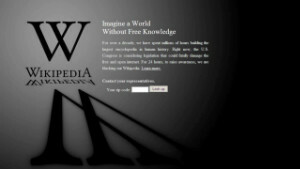 CNN: Would Wikipedia be able to exist if these anti-piracy laws were passed? Wales: I think it depends very much on exactly which version is passed. There's been a lot of debate and a lot of amendments -- some that passed, some that didn't. Some of these (provisions) would make it very, very difficult for us to continue. If you weaken these laws to a certain extent, it merely becomes an added expense and we would scrape by somehow. CNN: Which versions of the site will be down and how did you make that determination? Wales: It will be the English Wikipedia that is on strike, so to speak. Other language communities have done their own process of voting and polling. In general, I can say the Germans decided not to shut down their site but they are posting a banner in support ... Each language community makes their determination as to what they'd like to do. CNN: But the shutdown is global for the English site? Wales: It's global for English. That was one of the questions before the community. Should we target this to the U.S. only? Or do it globally. The decision that was made was a pretty strong majority decision ... The main rationale people gave for doing it globally is that U.S. law does affect the entire Internet. It does impact people globally. And, therefore, people felt like we should make this known everywhere. There's also an element of this sending out a signal to governments in other parts of the world that the Internet is going to get really mad if you try to censor the Internet. It's quite ironic because the U.S. policy has been quite firmly about discouraging censorship of the Internet elsewhere. So it's a bit of a shame that we're trying to do it at home.